Hello ... Hello ... my old friends ... It's great to see you once again! I honestly didn't know what to expect as Yours Truly KJS journeyed by train en route to the Gatecrasher venue on Broad Street in "Down Home Town" Birmingham last night [Thursday 28th April]. We sat out the whole gig nestled in some VIP seating directly to the left of the stage and were greeted on arrival by the dulcet tones of ELO, The Move and ELO Part II being blasted out via the PA! On my right was an 89 year old lady [who told me that she was a pianist who happened to like rock music] and a gentleman named Ray Fullard who told me that Jeff Lynne produced one of his tracks back in 1986. To our left - on stage - just a few away was former ELO Part II front man Neil Lockwood - presently on vocals and keyboards - and just beyond Neil was Man of the Moment Bev Bevan with his now legendary Slingerland drum kit. Bev was presented with his Broad Street Walk of Stars award in advance of the gig by the Lord Mayor of Birmingham, Len Gregory. What transpired after that was a momentous concert that featured some of Bev's present musical Move mates in Trevor Burton, Phil Tree, Gordon Healer and Tony Kelsey as well as special guests and local Midlands entertainment icons Danny King, Raymond Froggatt together with [naturally] old pals Jasper Carrott and Tony Iommi. There were no ELO songs - not even "Roll Over Beethoven" - but that did not detract from a fantastic set of songs that included "Something Else", "Let There Be Drums", Danny King's wonderful rendition of "Yesterday", a fantastic thrash through "Paranoid" and "Gimme Some Loving" as well as the closing Move anthem "Blackberry Way". It was really ace being seated so very close to one of my musical heroes who played those drums [and percussion] with the mastery and finesse of a consummate professional at ease with his craft, whilst enjoying his legacy. What also has to be said is that there was an immense amount of musical talent on that stage last night. The stage presence of Trevor Burton, Tony Kelsey's driving guitar work, the phenomenal keyboard wizardry of Neil Lockwood, the surprising quality of Jasper Carrott's vocals - the list goes on. 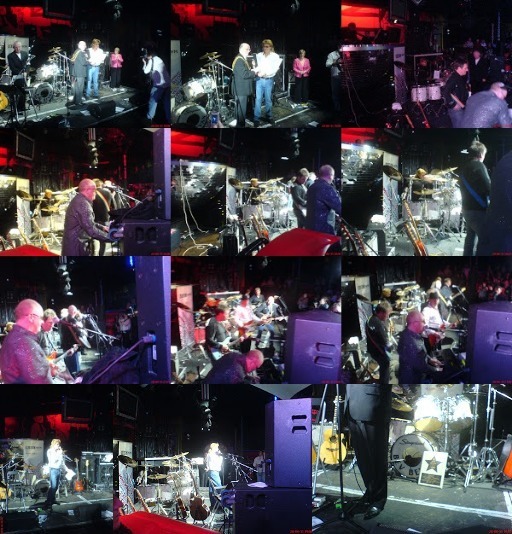 The concert was a fitting tribute to not only Bev Bevan's musical journey but also a treat to the many fans, friends and family who attended whilst raising a fair few pounds for charity. And yes - it was strange that there was little mention or musical acknowledgement to his successful career with Jeff Lynne and ELO - but I for one travelled back to Wolverhampton last night feeling extremely grateful to have been in attendance at Bev's latest 'Big Bash'. Great review Keith, spot on. which is a dedicated site for Richard Tandy and Dave Scott-Morgan's album, which is being re-issued as a special edition with bonus tracks. I hope you don't think I am spamming you with all of this, but you do not appear to have a contact email and I thought you might be interested in ELO related stuff.